Go outside. Look around you. Is it freezing and dreary? If the answer is yes, you may live in a place called America, where the weather seems to be generally terrible almost everywhere at the moment. No one is safe — not our homes, not our children, not even our Jaguars. 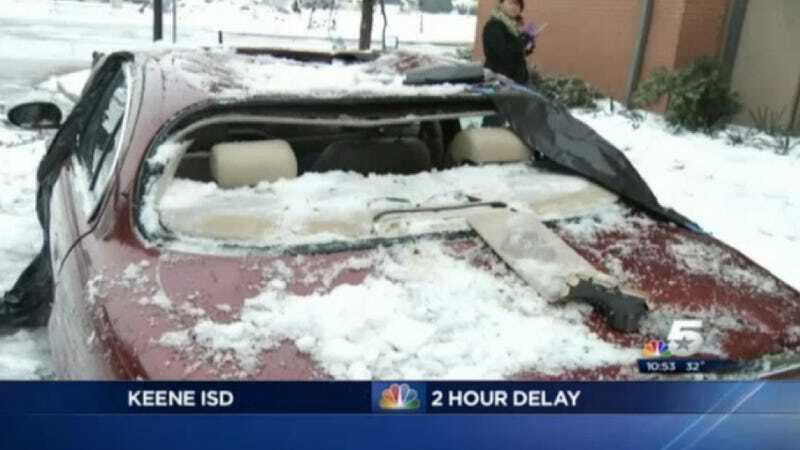 NBC DFW has the scoop on all of the vehicular destruction caused by giant sheets of falling ice in the Dallas-Fort Worth metroplex. They interview one man whose Jaguar S-Type's roof and windshields were completely trashed by ice that fell off a roof. He reports that he thinks the car is totaled, but luckily no one was injured. The wintry mayhem was not limited merely to European imports. Of course not — ice does not discriminate. The TV station also reports that a nearby Corvette and a Pontiac sedan were also badly damaged thanks to the effects of the ice storm. Click on over to NBC DFW to see the video. Ice! It hates you and your cars.